The purpose of Casa Youth Shelter is to provide temporary shelter for runaways and youth in crisis, enabling them to come through the crisis with an increased personal strength and a sense of renewal while in a supportive environment, with family reunification as a primary goal. A community where all adolescents in crisis have a safe place to stay in an environment that promotes healthy family relationships. 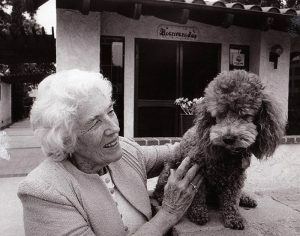 Casa Youth Shelter’s Founder, Myldred E. Jones, was a resident of Los Alamitos for 38 years and a woman of deep faith. A retired Navy Lt. Commander, Myldred’s military and humanitarian accomplishments were recognized by the likes of five U.S. presidents, Generals Colin Powell and Norman Schwarzkopf, and Pope John XXII. She dedicated her life to helping, volunteering, and watching out for the needy. Born in Philadelphia, the second of four children, she earned her B.A. in Sociology and Social Studies at Wittenberg College in Springfield, Ohio, and did graduate studies at UCLA in Sociology and Public Administration. She was teaching high school at the Frances de Paux School for Mexican Girls when, in 1942, the wartime call to duty led her into the Navy. She was in the first contingent of California WAVES to be called to active duty. In the days when marriage and motherhood were not allowed for career military women, she served with distinction throughout WWII, the Korean War, and the peacetime that followed, rising to the rank of Lt Commander. She was the first female faculty in the Armed Forces Graduate School of Information, Assistant Director, Dept. Welfare – Navy Relief Society, and the Naval Liaison to both the United Nations and the American Red Cross. After her military discharge, she was active in the Civil Rights Movement, marching with Dr. Martin Luther King, Jr. from Selma to Montgomery. She helped desegregate an Episcopal Church near Selma, as well as a military officers’ club. She also joined with Cesar Chavez on his marches for the United Farm Workers, and then worked in Watts and East Los Angeles to continue this work with teenagers. During an 18-month assignment as a Consultant for Youth Affairs, Myldred worked with then-Governor of California Ronald Reagan, conducting a study of issues affecting youth in crisis. Because of that experience, she participated in the establishment of the first Adolescent Hotline at Children’s Hospital in Los Angeles. Subsequently, hotlines spread across the nation and are now international. She also founded We Care, which offers aid to the homeless and near-homeless, and the Southern California Hot Line, which averages 1,000 calls a month from people in crisis situations. These non-profit organizations are all dedicated to youth in need. Through her work she recognized the desperate need to shelter runaway and abandoned teens who faced danger on the streets. She sold her Rossmoor home and used the proceeds to purchase two adjacent lots in Los Alamitos. This property became Casa Youth Shelter. At the age of 69 – when most people are settled into retirement – Myldred moved into a tiny house, and built Casa Youth Shelter next door. On April 7, 1978, the shelter welcomed its first troubled youth through its doors. Myldred ran and supervised the three-bedroom house that would shelter up to six youngsters at a time. With few funds, she relied on a backyard garden, the goodness of neighbors and friends, and her unfaltering faith to feed and clothe the kids that came to her shelter. Her vision and lifelong dream of helping children in need became a reality, and the woman who sacrificed marriage and children for service to her country would begin 29 years of accepting, loving, and sheltering at-risk youth. For many youngsters, Casa Youth Shelter was where they learned how typical families live – eating together, sharing the events of the day, and pitching in to do household chores. Not a week went by that a past resident didn’t check in to update her on their accomplishments, a new job, or a newborn child. It was a big job for a 69-year-old to start and manage a youth shelter. But she often said she didn’t do it alone. Volunteers, donors, and friends seemed to appear from nowhere when most needed. Sometimes a miracle came in the form of an anonymous check. Other times it was a stranger knocking on the door with extra food, clothing, or a few dollars. Somehow she managed, and with the help of an active board of directors, in 1984 the little 6-bed shelter grew to 12 beds plus a two-story building with rooms for meetings, classes, and counseling. She was thrilled when the organization was able to offer anger-management training at local schools and multi-lingual parenting classes. In 2008, Myldred’s cottage was transformed into the Myldred E. Jones Recreation Courtyard, as she had always wanted. In 2018, Casa Youth Shelter purchased the neighboring property; we are excited to carry on Myldred’s legacy of helping youth in crisis. Because of Myldred’s vision, today Casa Youth Shelter thrives as a safe haven for a growing population of at-risk teens, providing shelter for an average of 220 youth every year. Since that first day, Casa Youth Shelter has never been closed, and no child has ever been turned away for lack of funds. Her inspiration lives on in the shelter’s countless volunteers, donors, and friends.